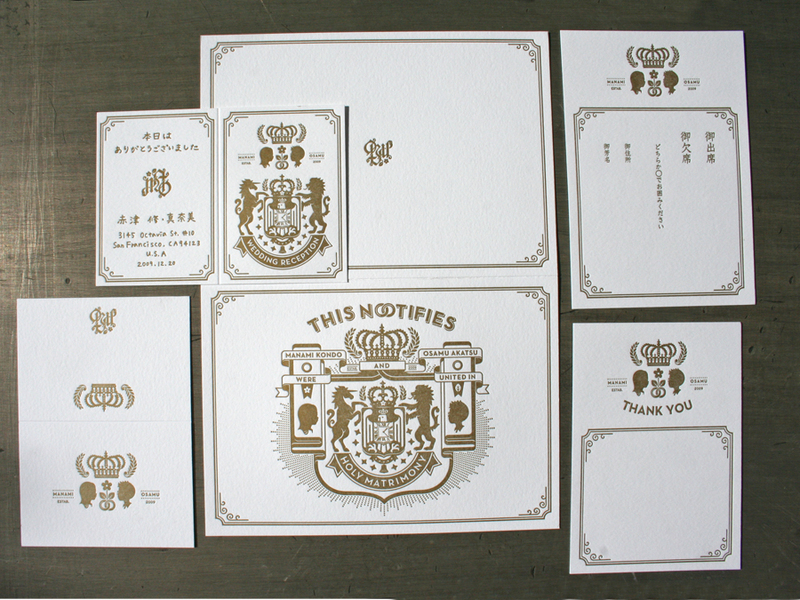 This simple one color wedding invitation was designed by the groom for the couples December wedding in Kyoto, Japan. The head silhouettes have a unique anime / manga style. We also love the modern graphic crest containing the interlocking rings and the matrimony announcement. It's a bold yet refined design - traditional subject with a modern presentation. Nice work Osamu! The cards were layed out together on a large 13 x 18 Flo White Crane Lettra 110lbC press sheet. These were printed on our Vandercook Uni III. We letterpress printed two passes of the gold ink for better ink density . Here's something to keep in mind when running a double pass on a cylinder press - don't adjust the packing on the press between pass one and two. By adjusting the packing, you also change the circumference of the cylinder, making it very difficult to register the second pass. We like to run two passes of ink metallics to give a little better sheen. Metallic ink, especially on an uncoated cotton stock will never be shiny like a coated stock or approach the mirror finish of a foil stamp, but it is crisp in details and does offer a small amount of shine.